The one you’ve all been waiting for Rapid Fire returns for 2018. 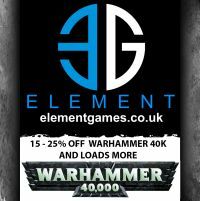 Stirling Wargamers are proud to announce our annual 40K singles event. We will be releasing information in the upcoming months however to get you started, Rapid Fire 2018 will be a 5 game tournament, over the weekend of the 27th of October, lunch is included on both days and tickets will cost £25.